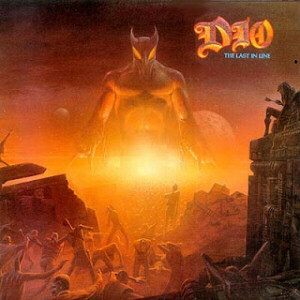 What "new" can you possible type down about Ronnie James Dio aka Ronald James Padavona. Vocal God and hard rock legend? Indeed. Constantly flashing the devil horns and muttering on and on about dungeons and dragons? Absolutely. While alive and probably still in his grave (R.I.P.). The little Elf - big voice - lost his battle against Cancer in 2010 and can be found resting at the end of the rainbow with his pals in metal, Murray The Demon and Dean 'The 20-foot Dragon'. Geez. The cheesy image and costumes of the eighties is kind of hard on the eyes, but the songs, and the powerful pipes, man, what a voice! Here are the result and top-10 from the DIO (the band/solo) years and we decided against the Rainbow and Black Sabbath material. It's been a while since I last listened to RITD and ehem, I don't recall the keyboard sound to be quite this upfront and corny in the past? Thus why they decided to bring in a proper keyboard player afterwards since this is the rather average Casio work of RJD. Viv Campbell delivered some of his best ever guitar work though. Hitting every flashy note of the eighties and sending out the message to the rest of the world. What message? That a new guitar hero is born? They basically used the same structure and template for both 'Mystery' and 'Hungry For Heaven'. They all belong to the same category of catchy "hair-metal" of its era. Let's face it. This could just as easily have been the work of Ozzy Osbourne ála Shot In The Dark or half a dozen of other bands. To some it's standard Metal ála MTV, but it's darn catchy. The haunting eerie opening, the driving bass, the pipes, the pipes! The atmosphere of Sab's 'Heaven and Hell' and over the top lyric in the style of Survivors 'Eye Of The Tiger' only this time we're supposed to Ride The Tiger? "You can see his stripes but you know he's clean Oh don't you see what I mean". What did he actually mean? 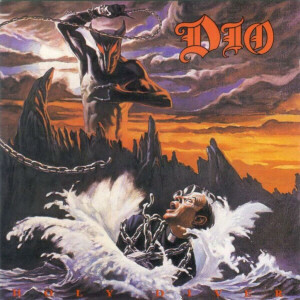 The art cover including the "Holy Diver" aka Priest and Murray the Demon may not add much to the overall story. The list of "Do not". Don't talk to strangers - 'cause they're only there to do you harm. Don't write in starlight -'cause the words may come out real. Don't hide in doorways -you may find the key that opens up your soul. Don't go to heaven -'cause it's really only hell. Don't smell the flowers -they're an evil drug to make you loose your mind. Don't dream of women-'cause they'll only bring you down. The message is basically: be very afraid. The ultra slow and soft opening add extra power to the vicious six-string attack by Campbell. To be honest. They borrowed quite a lot of Viv's work on this track to later use as main riff on "We Rock". Yeah. No? Perhaps. Maybe. Whatever. Excellent schtuff. 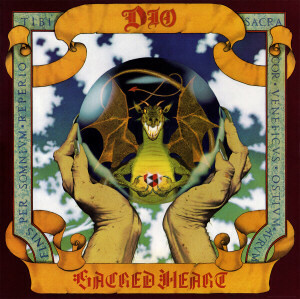 RNRC showcases DIO and the band at the height of their songwriting powers and it was basically down hill from this point on. You simply can't ignore the instantly memorable chorus and the flashy guitar work. "We're a ship without a storm the cold without the warm light inside the darkness that it needs yeah. We're a laugh without a tear the hope without the fear we are coming hooooome". 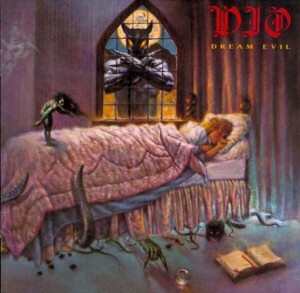 In my opinion the most "progressive" song of all the DIO classics and no doubt my favorite moment. The neat and basic intro which explosive into the rather moody and yes, dare I say "progressive" metal tune (not prog-metal though).